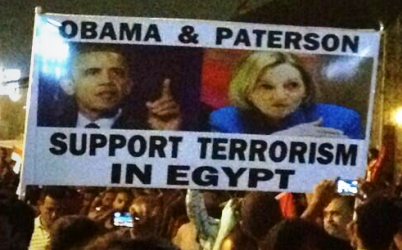 Such blatantly pro-Muslim Brotherhood assurances by Patterson are consistent with many of her other actions in Egypt, which have led most Egyptians, including politicians and activists, to refer to her as a Brotherhood stooge. Among other things, in the days leading to June 30, she called on Egyptians not to protest — including by meeting with the Coptic Pope and asking him to urge the nation’s Christian minority not to oppose the Brotherhood, even though Christians have naturally been the most to suffer under Morsi, especially in the context of “blasphemy” accusations. Thus, and once again, the Obama administration makes indubitably clear that its primary interest in Egypt is to see the Muslim Brotherhood stay in power, the Egyptian people’s will — the will of tens of millions of secularists, liberals, moderates, and Christians — be damned. Filed Under: From The Arab World, Islam Tagged With: Egypt, Muslim Brotherhood, Obama, U.S.